There's currently an engrossing exhibition at Cambridge University Library called A Damned Serious Business, commemorating the bicentenary of the Battle of Waterloo. On display are many documents worth lingering over; one that especially caught my eye is this mock theatre poster. It must have been produced in about 1803, soon after the end of the Peace of Amiens (March 1802 - May 1803) which had briefly interrupted the wars between Britain and France. Napoleon was assembling his L'Armée des Côtes de l'Océan at Boulogne, ready to invade England. This poster in the form of a playbill was a part of the propaganda effort designed to inspire the British in their efforts to repulse the invaders. It appears to have been produced on the initiative of a private individual, one James Asperne, rather than by the government. 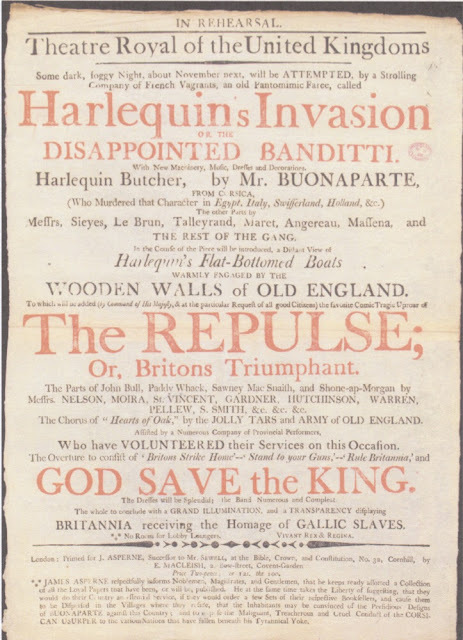 No doubt he hoped, as well as stiffening the moral backbone of the nation, to lighten its pockets by charging twopence per poster, or 12 shillings (about £55 now) for a hundred, cannily combining patriotism with profit. The small print at the bottom 'respectfully informs Noblemen, Magistrates and Gentlemen' that they will be performing an 'essential Service' to the nation if they buy and display 'a few sets'. He also states that there is 'No Room for Lobby Loungers', which is a term I'd not come across before, (though obviously the implication is that everyone must pull their weight in fighting the invaders). Doctor Google tells me that lobby loungers were fashionable but dissolute young men who went to the theatre not out of love for the dramatic arts, but more because they hoped to hang around in the lobbies and bars in the hope of finding love of a different sort by meeting actresses or prostitutes (the two professions were popularly supposed to be virtually synonymous). The term has an appealingly louche ring to it. In the end, of course, no invasion came: Trafalgar put paid to Napoleon's invasion plans. It's interesting to speculate, however, how successful he would have been had he put his plans into operation. He had a well equipped army of 200,000 men, and Britain certainly took the threat seriously. Crossing the Channel would obviously have been a serious problem; the Royal Navy, by far the most powerful navy in the world, would have intervened decisively with their 'WOODEN WALLS of OLD ENGLAND'. Napoleon planned to trick the Royal Navy into sailing off somewhere else, probably the West Indies, a plan that was pretty unlikely to have succeeded, but even if it did it seems improbable that 'Harlequin's Flat-Bottomed Boats', the French navy's troop carriers, would have been sufficiently seaworthy for the job. Even moderately poor weather would have decimated them. * But even so, perhaps a significant army could have landed on the south coast. In this case I think they would have had some initial success, but their supply lines would in a few days become overextended, and the British army and civilian militias would have fought them to a standstill. Napoleon blew the whole income from the Louisiana Purchase (when France, in 1803, sold its territories in America to the United States for about £150 million in today's money) on a gamble with extremely long odds. Had Hitler invaded in 1940, incidentally, it would have been equally disastrous (for Hitler, that is), for the same reasons. Another much larger hypothetical question with which to entertain ourselves is, should we be glad or disappointed that Napoleon was defeated? Britain at the time was an oppressive oligarchy, and France was the land of Liberty, Fraternity and Equality, and the Napoleonic Code. On the other hand, at least the PM Henry Addington had been elected (albeit by a tiny minority of the population), while Napoleon was essentially a military dictator who'd seized power in a coup, and I dare say that many people in France didn't feel very free, fraternal or equal. Had he won then presumably Britain wouldn't have become the world's superpower; whether this is a good or bad thing is too big a question to debate here. The Cambridge exhibition, by the way, tends to be rather anti-Napoleon. * Single-issue pedants sometimes like to point out that 'decimate' originally meant to kill (exactly) one in ten. This is true. It's also true that words change their meaning, and that it now means (much more usefully) to kill or render useless approximately nine in ten.